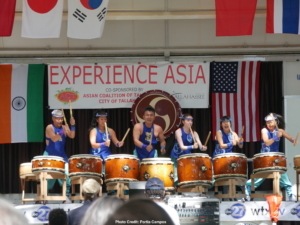 The Asian Coalition of Tallahassee (ACT) presents its 14th annual Experience Asia Festival on Saturday, October 6 from 10 a.m. to 5 p.m. at downtown Tallahassee’s Lewis and Bloxham Parks, located at 205 East Park Ave. Featuring free admission, the family-friendly festival celebrates the diversity of Asian and Asian Pacific cultures through performances, demonstrations, cuisine, arts and crafts and more. The festival’s two stages will host engaging displays from Japan, the Philippines, India, the Middle East, Indonesia, China, Taiwan, and the Polynesian Islands including Hawaii. Traditional drummers, dancers, musicians, martial artists and others will represent their unique culture and express their heritage through shared cultural experiences. Additionally, Experience Asia features more than 60 exhibitors and vendors of food, arts and crafts, jewelry, clothing and other cultural items that are available for purchase. Sponsored by the Consulate-General of Japan in Miami, the festival’s featured performers are the Matsuriza Taiko Drummers, who offer a dynamic and thundering performance of the 2,000-year-old Japanese art form on the festival’s main stage. Under the leadership of Takemasa Ishikura, who directs the group in playing both traditional music and modern arrangements, Matsuriza performs almost daily at Walt Disney World’s EPCOT. A fan-favorite of the festival each year, Matsuriza continues to mesmerize listeners with their rolling, clashing and dramatic choreography and sound. At the Japan booths, guests will have the opportunity to write their name in Hiragana and Katakana, create Tanabata decorations, make origami, try on a Yukata (kimono), learn about Ikebana (the art of flower arrangement), purchase Japanese crafts, and join students from FSU and Georgia State University in a traditional parade of a Shinto shrine. Last year, Experience Asia attracted more than 18,500 people from Florida and Georgia. Launched by the ACT in 2004, the festival brings together various Asian communities within the Tallahassee area and shares Asian heritage with the community at large through unique cultural experiences. Experience Asia is sponsored by the City of Tallahassee, Visit Tallahassee, the Tallahassee County Council on Culture & Arts and WTXL. For more information, visit www.asiantlh.org or contact 850-339-5227. For questions, contact ACT Chair Aurora Torres-Hansen at auroratorreshansen@gmail.com or 850-321-1114. For more information about the Consulate-General of Japan in Miami, please contact Miwako Patton at culture@mi.mofa.go.jp or Hector Franco at webmaster@mi.mofa.go.jp and visit www.miami.us.emb-japan.go.jp/itprtop_en/index.html.